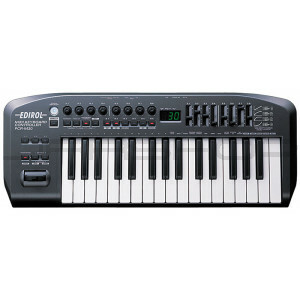 The PCR-M30 is a revised version of the popular PCR-30 MIDI keyboard controller. Like the PCR-30, the PCR-M30 offers direct connection to the computer through USB, plus 32 keys, 27 assignable MIDI controllers, a software editor, MIDI input and output, and sustain and expression pedal connections. Advancement the PCR-M30 has over the PCR-30: the addition of velocity curves, a switchable MIDI interface, and a new key-action found on Roland’s higher-end synths that provides less mechanical noise while offering a consistent, playable feel. The pitch-bend/modulation controller has a new rubber coating for easier grip.